I've just installed Ubuntu 10.04 into VirtualBox on Windows 7. 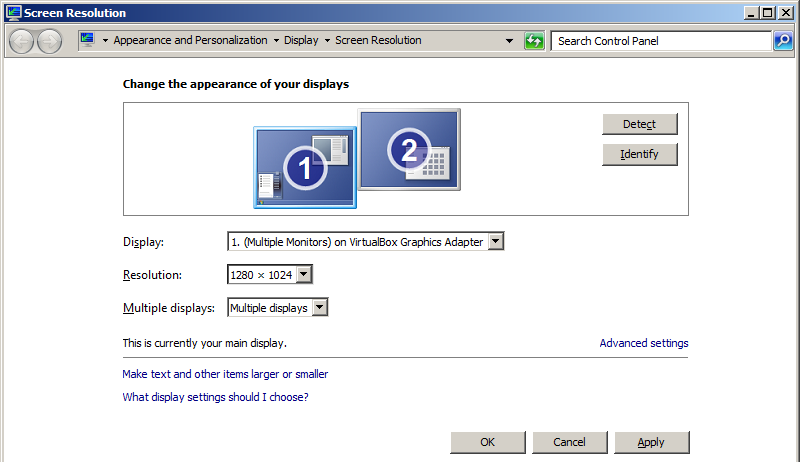 Unfortunately the only options showing for screen resolution are 640x480 and 800x600 and the monitor is showing as 'Unknown'. How would I go about upping the resolution to 1280x1024 (I'm on a 1600x1200 monitor)? I tried mounting the VirtualBox 'Guest Additions' ISO (from the VBox 'Devices' menu) and doing sudo sh ./VBoxLinuxAdditions-x86.run from the mounted drive, which gave 2 new listed resolutions after a reboot (1024x768 and the 16:9 version of that resolution). These worked when I selected them but disappeared when I switched back to another resolution. I tried rebooting and running VBoxLinuxAdditions-x86.run again but onlu the 2 low res options listed this time. Seems to be a VBox problem rather than an Ubuntu problem as after reinstalling 10.4 overwriting the original virtual partition, sudo sh ./VBoxLinuxAdditions-x86.run now has no affect at all. You need to install the VBox guest utilities to add support for the virtualised graphics hardware. Click inside the Ubuntu screen again then go to Applications - Accessories then Terminal. The terminal window is where you will run the file from, but first we must navigate to the correct directory. 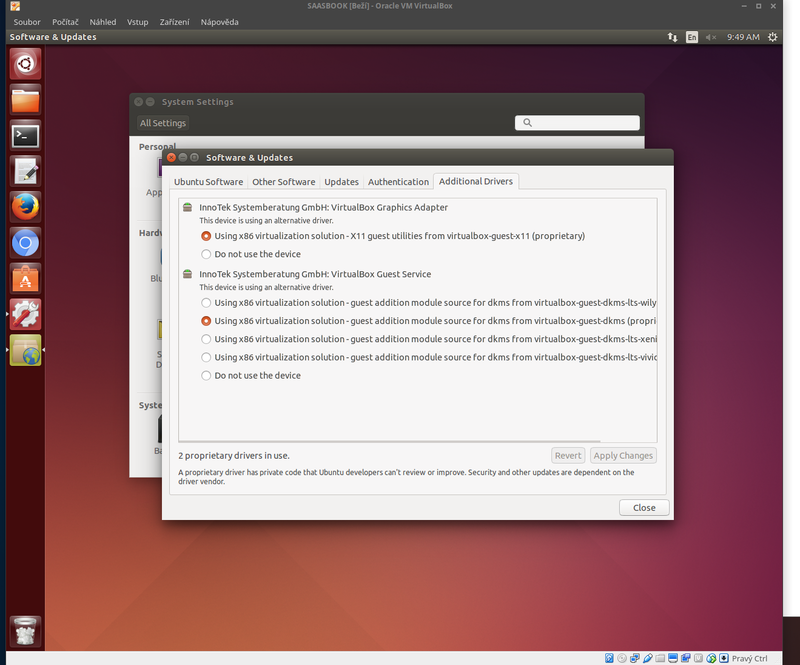 Log onto the Ubuntu desktop and this time go to System - Preferences then Screen Resolution. You should now have more options than the three low res options you had at the beginning of the day! It will ask you for a password which is the same as you log in with. You must now do a "save as" but be careful here as this time we need to call the file xorg.conf again. If you just hit save here you would have saved the changes over the backup file you created! You are done. Hit Ctrl+Alt+Backspace to restart your virtual box, log in and enjoy your new screen resolution options! Devices > Install Guest Additions, let it run then log out. When you've been returned to the login screen you'll see it's the full size of your monitor. Log in and you're good to go. I had the same problem and then found out that if you launch the virtual machine > click "view" on the toolbar > click "auto-resize guest display, then your virtual machine will have the same screen resolution as your own screen. Once the Vbox Additions has been instaled (and reboot the guest os), press Host + H, then maximise the window, thats sould do the trick.. Try increasing the amount of RAM allocated to the Virtual Box. Worked for me. To do this, stop the VM, then in VirtualBox go to the Settings for the VM. Go to the Display section. You can increase the Video Memory there. Mine was 1MB; I increased it to 32MB and that allowed me to use my 24" monitor fully. Settings > Video > Video Memory = 128 MB, Enable 3D acceleration = true. Host Key Right Ctrl at default + Home = view full screen. I have tried to exclude every step except GuestAdditions installation. You need every one of them. I can tell you how I do this with Mac OS X as the host system. Maybe it will work on Windows too. I had the same problem and was able to fix it by using the xrandr utility. I followed this article to fix the issue. Sometimes this may help you. Give it a try. Then start VirtualBox back up and the problem should be fixed! After installing guest additions: Go to settings > Display Increase video memory and enable 2D and 3D video acceleration. It is probable that your brand new install of a linux distro on your Virtualbox is still fresh and that much more needs to be done to set up your environment, not the least of which is to enable the X Window system if all that you are seeing are display settings for 4:3 aspect ratio and entering 'startx' at the command prompt does nothing. If you had set your virtual machine to fullscreen mode prior to entering 'startx', then the screen will automatically adjust to 16:9 aspect ratio, with tool and task bars in their proper places. Also, check autoResize option and VirtualBox will automatically set the display size as you resize or maximize the window. This may have already been resolved but I had this issue and fixed it very simply, I just updated VirtualBox to the latest version then re-installed the guest additions. VirtualBox 4.3.12 was preventing the above solutions from working on my Windows system. 4.3.18 was released somewhen around 2014/10/10 (2014 Oct 10), all of the above works since installing that. The "VBoxManage setextradata global GUI/MaxGuestResolution any" command appeared to work previously, that is to say it didn't throw any errors. Installing guest additions had previously complained that the header files were not installed, however they absolutely WERE (& have been left untouched) as evidenced by the fact that installing guest additions under 4.3.18 upgrade does not throw the error when building the shared folders module. Here is a 2016 updated answer that worked for me. To start, I'm on Mac 10.11 (El Capitan), and my VirtualBox is 5.0.26. I'm running Ubuntu 14.04 LTS in this example (I need to upgrade my Ubuntu eventually). Once the VM is up and running again, go to "View -> Virtual Screen 1 -> [whichever resolution you want]". My options were all the way from 640x480 to 1920x1200. Once I selected a new resolution, I did not have to restart the VM again, it automatically scaled. If someone is confused because of the value of shown Display field, the reason is that I don't use Windows 7 as my Host OS, so I've used it on VirtualBox in order to simulate problem. If you would like to use different resolution on each monitor and/or you are not sure how to align displays in previous window, clicking on "Detect" button should do things properly for you. You probably wouldn't suspect that that causes problem because, if you use Windows 7 (or any newer versions of Windows) as Host OS, it will successfully render image on your monitors, even when the set positioning is distorted as shown. I've been struggling with this problem on many tested Guest OSs like Ubuntu, Windows XP and Windows 7 (so the issue in my case wasn't related to Ubuntu nor Linux at all) and after properly configuring that setting, I was able to choose larger desired resolution in my Guest OS (of course, you should previously install VBox Guest Additions as it is stated in several answers). Because my reputation is not enough to add a comment for @maco's answer, I'm writing this as an answer. I'm using Ubuntu 16.04 and I installed the VBox utilities as @maco's answer however when I locked the screen I could not used my keyboard and mouse anymore. There is a bug report about that. I found the solution here and totally it took me 2-3 hrs. My problem/solution was actually strange, I had a another laptop/monitor with a lower resolution set up in Windows as a main display. Therefore no matter what, even if I had a max option in View/Virtual Screen 1920x1200, this time it was not checked. I am using i3 GUI , gnome behaved even more strangely. Once I configured my 4k 3840x2160 in Windows as a main monitor, VirtualBox adapted correctly. (Maybe I combine it with a lot of solution here at stackexchange and other websites.) ,but setting up the 4k display as a main display in Windows was basically a solution for me. Note: Also previously I configured linux ubuntu resolution via command line by a process of these commands - How to set a custom resolution? xrandr --output VGA-1 --mode "2224x1250_60.00"
Not the answer you're looking for? Browse other questions tagged virtualbox resolution or ask your own question. How do you change display resolution in KDE Plasma 5? Why isn't my monitor's native resolution appearing as an option? How do I get 2560x1440 resolution within VirtualBox on a Mac? Virtualbox, How do I change guest (precise) resolution to 16:9 (1920x1080) instead of default 4:3?